for $325,000 with 4 bedrooms and 2 full baths, 1 half bath. This 2,665 square foot home was built in 1997 on a lot size of 0.3300 Acre(s). YOUR SEARCH IS OVER! 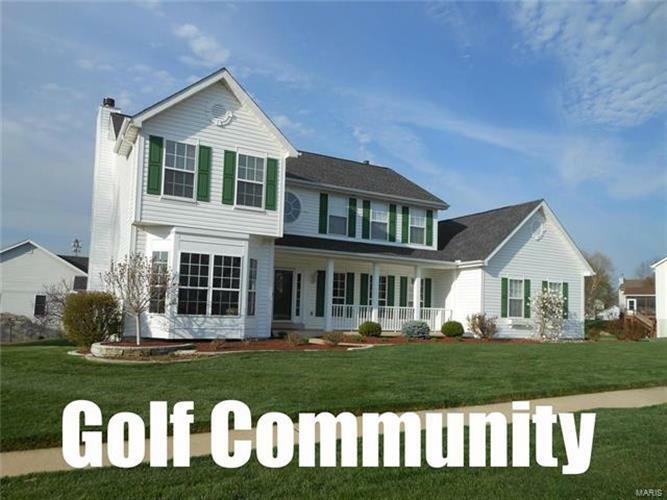 Fall in love with this impeccable Golf Community 2 Sty that's perfectly positioned on a BIG .33ac corner lot! The lush lawn & curved limestone flower beds are your first glimpse into your dream home! 2sty hdwd foyer, T-stairs, balcony & AMAZING chandelier! Liv/Din '“ bay, millwk & fab liting! Hdwd pwdr! Fam Rm, 6 wndw bay, w/b f/p, recessed lites! TOTAL REMODELED Kit/Bkfst wood look ceramic, granite, islnd, wine chiller/dry bar, Shaker Styled cabinets & atrium door to 14x14 screen porch plus sun & BBQ decks! Wood look ML Lndry! Upstairs - 4 BIG bedrms (one used as office w/hdwd) plus a vltd Master! Mstr Glam bth '“ xtra deep jet tub, sep shwr, dbl granite topped vanity! ALL full bths, ceramic floor! Beds, lited fans! Hdwd hall! Southern Charm & 28x5 covered front porch! 3c side entry! Irrig systm! Unfinished walk out, bth rough in! One of a kind RESORT LIFESTYLE AMENITIES - pool, splash, plygrnd, ten/bball. Golf memberships OPTIONAL or pay as u play! LIVE your DREAM!